Let's get all hypothetical for a second. Pretend you're sleeping at home and some dude breaks in and is going to rob you/kill you. How will you defend yourself quickly? Enter the Safe Bedside Table, a genius creation from designer James McAdam. 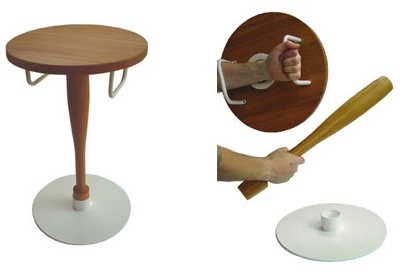 What looks like a simple, basic table at first, quickly becomes a shield and sword ready for your defense. We're talking King Arthur-style, though, because you'll be greeting those attackers with a medieval-style shield and wooden club. No sharp swords or maces here. Remember to call 911 first before you start screaming things like, "Have at you, blackguard!" The whole thing is made of cherry and steel so it won't look hideous, either.